Crinoids are a group of marine invertebrates that were abundant in the Mississippian Period (359-323 million years ago). 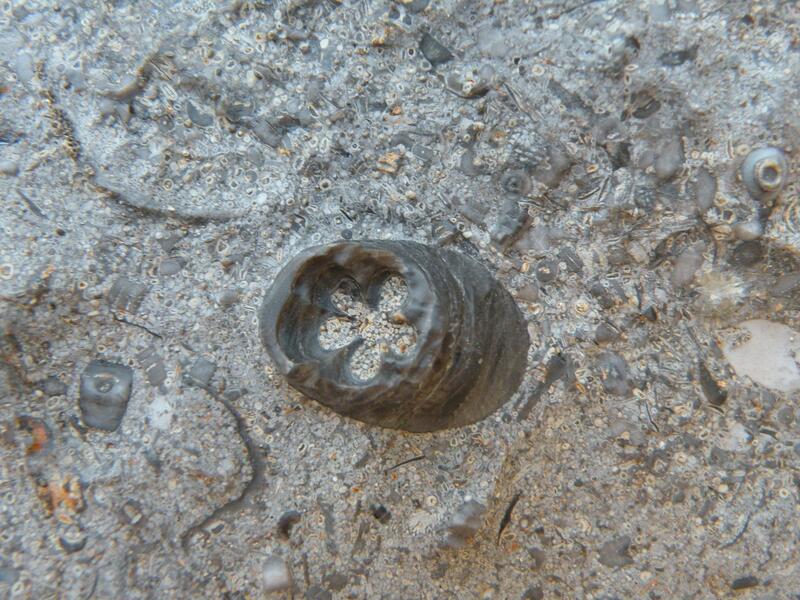 It is unusual to find a complete crinoid fossil; however, pieces of the stalk (commonly called stem or column) are abundantly preserved in the rocks in northern Arkansas. The center portion of the stem in this picture has dissolved away and ooliths were deposited in it. Ooliths are small round bodies, usually 0.5-1 mm in size, and are commonly formed of calcium carbonate (calcite). They are formed as successive concentric layers precipitate around a nucleus such as a shell fragment, algal pellet, or a quartz-sand grain. The layers form in wave-agitated water such as a shoal environment along a shoreline. The rock type is called an oolitic limestone. Fossiliferous and oolitic limestone is present in the Pitkin Limestone in northern Arkansas. This entry was posted in GeoPic of the Week, Sedimentary Features and tagged Crinoids, Fossil, invertabrates, limestone, Mississipian, ooliths, Pitkin on October 4, 2013 by argeology.